Technology not only makes a lesson interesting but also reduces the effort of teachers in making it interesting. 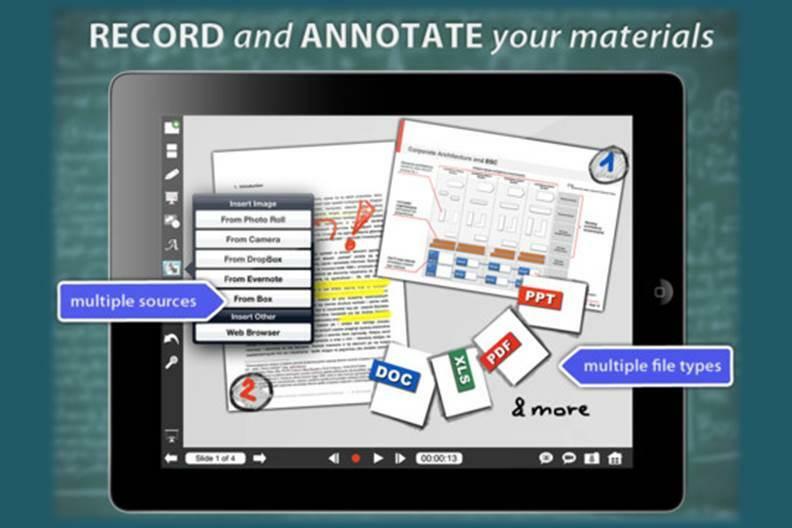 In this article, we’ve come up with the information about an iPad app that helps teachers to annotate, animate, narrate, import and export lessons. Explain Everything is a remarkable app that allows educators to create beautiful lecture captures, tutorials and whiteboard activities on your iPad. Let’s learn more about it. To create a new project, hit “New Project” in the upper left-hand corner. The best advantage of “Explain Everything” app is that it allows you to import presentations from Dropbox, notes from Evernote, photos from Photo Stream on your iPad, or contents of your Box account. Similar to Prezi, Explain Everything provides infinite space on every slide, you can move things like images and videos around by adjusting their sizes. Another great feature of Explain Everything is when you import a PowerPoint presentation, it automatically creates a slide for each slide that’s in the presentation. There is a list of tools provided on the left-hand side which help you create an effective lesson presentation. Let’s learn about these tools quickly. Create a New Slide: The top most button on the list is to create a new slide. You can notice the number of slides in the bottom left and you can move back and forth between slides by navigating right and left arrows. This is one of the most important tools of “Explain Everything” which allows you to change the colors, thickness and also transparency of your annotations.You need to click and hold down to get access of this Pen tool. Pick a color, adjust the thickness and start writing. This tool is really helpful when you’re giving a lecture through a projector. Click on the laser pointer icon and wherever your cursor points (On your iPad screen), students are able to see it on the projector as a laser point. It allows you to pick various shapes, change their color or fill them with it, and put them on your screen with drag and drop feature. You can even move them around. This tool provides you with the zoom out feature to have an infinite space by adjusting the sizes of things (images, writings, shapes etc.) and moving them anywhere around the slide. This tool allows you to add text with different sizes, colors and of different fonts. This tool allows you to import content from anywhere at anytime. The above mentioned are the basic tools that help you present an effective lesson. Let’s learn about a few more important features of “Explain Everything”. At the bottom, you can see a red dot, this is where the lecture capturing comes in. If you want to record on a slide in the presentation, just hit the red button and start recording. You can press pause, flip back and forth between slides, and record on each of the slides too. It records your voice as well as your works on screen. 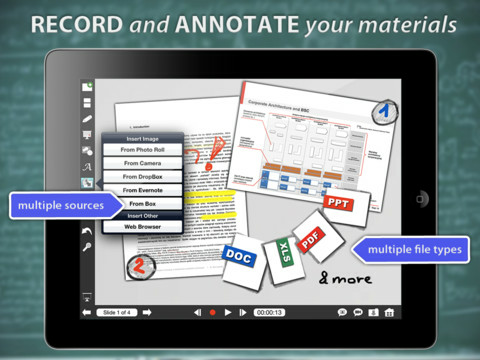 Exporting annotations and screen recordings is very easy with “Eplain Everything”. In the bottom right-hand corner, you can find options to share your lesson captures. There are many options to export your slide: Image to Photo Roll, Image to E-Mail, Image to Dropbox, Image to Box or you can export your presentation slide as a PDF too. It allows you to upload your screen recording videos directly to YouTube. In addition to the above features, Explain Everything version 2 includes a few more features like template-based creations and more. With Explain Everything, users can create slides, draw with any color, add shapes, add text, and use a laser pointer. It also allows you to rotate, move, scale, copy, paste, clone, and lock any object added to the slide. Requires: iOS 5.1 or later. We hope this information is useful to you to know all about this great app for teachers. Explain Everything is now available on iTunes.